No, that's not quite true. I can't stand the concept of gamers. Hell, I like videogames so much that I'm doing a friggin' PhD in game studies. Should we care if Douglas Wilson, a doctoral candidate in game studies, hates us? I think we have to. The problem here isn't the old town-gown conflict; it's not that game studies scholars look down their noses at the working-class gamers who happen to reside in a virtual neighborhood that borders their own. If that were the case, gamers - including academics like me who study games but remain firmly outside the "game studies" camp - could just say, "Well, Douglas, we hate you too." Unfortunately, it's worse than that; and although we've been ignoring it, we probably shouldn't ignore it any longer. What follows is meant to be provocative. I hope those I am trying to provoke will take it in that spirit, and provoke me in turn. The problem with game studies - the thing that gives rise to opinions like Wilson's - is that the effort to create and maintain the discipline is keeping gaming from winning the respect it deserves. 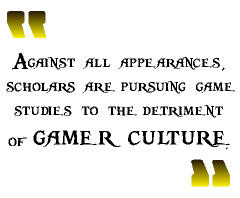 Against all appearances, scholars are pursuing game studies to the detriment of gamer culture. "Quibus lusoribus bono?" means "as a benefit to what gamers?" Cicero used to ask "Cui bono?" - "as a benefit to whom?" - when he wanted a jury to see a defendant's guilt. The defendant, Cicero said, had a motive because he gained something from the crime. It's hardly surprising that game studies benefits academics with the stability of tenured jobs, but I'm only exaggerating slightly when I say there's a crime here, too. J'accuse. In 2005, Espen Aarseth, the founder of the discipline's eponymous journal, Game Studies, published an article called "Game Studies: What is it Good For?" The piece you're reading right now is my plea to gamers to turn the tables on Aarseth and other doyens of game studies like Henry Jenkins, Janet Murray, Ian Bogost and Jesper Juul, not to mention the scions of their race like Douglas Wilson. Wilson beseeches us in his gamer-hating piece to stop seeing ourselves as gamers; I want us to encourage him to see that gamer culture needs to broaden and expand, not wither away. He wants us to embrace the goals of game studies, but achieving those goals, unfortunately, will help him and not us.